The SVGFF, like 36 of the other 41 member associations of CONCACAF, staged a day of activity, last Saturday at the Calliaqua Playing Field. A football festival, which consisted of small sided games, consumed the dayâs main focussed activity. At the end of the competition, Fresh Youths emerged winners, with My Youth placing second. North Leeward and Roseans tied for the third place. 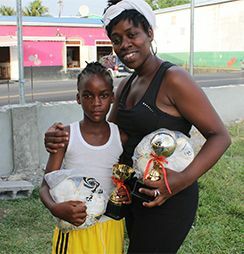 Scoring the most goals – 14, was Fresh Youthsâ Janique Browne. Taking the prize for the oldest player on show was Natasha Sampson, with the youngest being Areka Hooper. Both Sampson and Hooper represented North Leeward. The four top teams received trophies and quantities of soft drinks, while the individual recipients got trophies and balls. A quiz in which the winner of each trivia question received a football, added to the publicâs involvement in the short presentation ceremony. Head of the womenâs committee for football here, Yolande London, told SEARCHLIGHT that she was satisfied with the dayâs outcome. âWe were happy that we were able to join with our CONCACAF countries in celebrating the womenâs day,â London said. âIt was a joy to spend the day with our females in football, simply enjoying the game…Football is fun and I hope more females will become involved in the game…. We are committed to do our part to see this hope materialize,â the tireless London related.